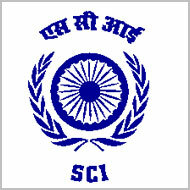 Shipping Corporation of India (SCI) published notification for recruitment for 50 Trainee Electrical Officer. View more information about recruitment for e.g educational qualification, selection process, no of posts, name of posts, age limit, application fees, how to apply, important dates, important links all are as under. View more details for above said posts by following link. Educational qualification: Candidates should have BE/B.Tech/ Diploma in Electrical or Electrical & Electronics. Eligible candidates will be required to appear in interview.